I think it’s time to come clean about one pregnancy thing I’m not too excited about: preparing freezer meals. It’s not the actual preparation I’m concerned about but it’s the eating of the actual meals. My freezer is good for about one thing: holding ice cream (and ice cubes). Beyond that, anything that goes into the freezer is usually eaten in protest because it never taste the same as when prepared fresh. I know that these meals are going to be wonderful to have when I’m low on sleep and just not having it, but still- not happy about it. In a skillet, combine black beans and liquid with the garlic, chipotle powder, sea salt and lime juice. Heat over medium-low and cook until the majority of liquid has been absorbed, 6 to 8 minutes. Meanwhile, scoop the avocado from its shell and place it in a bowl. Add the minced cilantro and lime juice; mash with a fork until avocado is in small chunks. Preheat a griddle or large, flat skillet over low heat. Brush one side of a tortilla with olive oil and place it oil-side down on a plate or other clean surface. Sprinkle with 1/4 of the cheese, followed by 1/2 the black beans, 1/2 the avocado mixture, and finish with another layer of cheese. Place another tortilla on top and brush the top side with olive oil. Repeat with remaining ingredients to make a second quesadilla. Cook the quesadilla over low heat, flipping once, about 4 to 5 minutes. The tortilla should be browning and crisp and the cheese should be melting. Repeat with second quesadilla. Cut into wedges to serve. Oh my goodness I have the same aversion about the freezer as you. I used to be all about freezing the left overs of a sauce or casserole and making sure I wrote on the lid but then I slipped up and there were mystery containers in my freezer. I reheated a small one for my dinner one night and I had freezer tasting pasta sauce. SO disgusting! Since then I avoid freezing things (or only freeze them for 1-2 weeks max) and would rather eat cheese on toast than freezer tasting sauces! This recipe is going to be a life saver for me this week. I have all the ingredients and had ‘cooking block’ with what to do with them. Craving mexican food this popped up in my instagram this morning and woohoo! Dinner is sorted 🙂 Thanks! These are beauties! Love the lime! I love love love your recipes! I am so very looking forward to your new book, I know it will be exceptional! 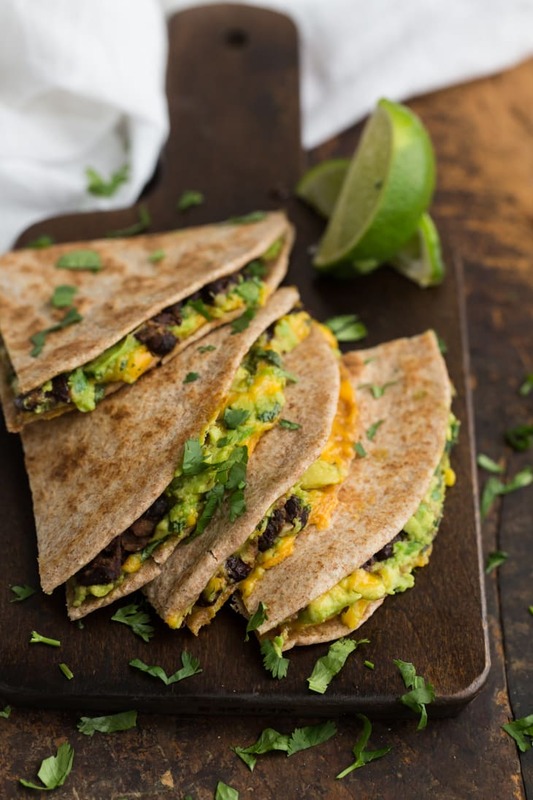 Defintely will be making these quesadillas (who can resist quesadillas anyway?) soon! I love the simplicity of this recipe! I just added it to my to do list 🙂 So glad I discovered your blog! So much yumminess in one place! Quesadillas really are the perfect recipe for non-cooks! They’re the perfect quick dinner too, and should make them more. Love the chipotle chili powder in these! What wonderful friends! That’s just what every woman needs in late pregnancy and postpartum – freshly cooked nutritious food delivered ready to eat! These look incredible! I usually use black beans to make brownies but I am such a lover of avocado that my next tin of beans is definitely reserved for these! Aaah! Anything with avocado in it just drives me nuts! I love this! I had to laugh about your freezer meals comment because even though I regularly throw very tasty leftovers into mine, I rarely am excited about eating them (cassoulet is my one exception). And today, as I pulled out some Ethiopian lentils for lunch that have been collecting freezer burn for God knows how long, I had to ask myself why I continue to make so much food…you have a better reason though! So funny! Freezer meals are such a reality of my life that I don’t even think about it anymore. Ha! Quesadillas visit our table often as well too. 🙂 Thanks for the reminder that simple can still be beautiful. This looks hearty but fresh and delicious. Can’t wait to try! These quesidilla look soo yummy – and I love that they are husband friendly! what a great recipe! I love things you can freeze and use at a later date. Honey have been on a quesadilla roll lately! And don’t worry, guacamole is always delicious! My family is in for quite the treat this week. Am making up my new list of things for March, and this one caught my eye. I love all things avocado and quesadilla it seems and this one meets all the healthy requirements we’ve made to our lifestyle lately. This I’m sure, tastes just like it looks. AMAZING. Made these for dinner the other night and they were AMAZING! So full of flavor! Thank you for the great recipe! I’m not big on freezer meals…but I did manage to make one baked pasta during the last week of my last pregnancy…it was like a desperate attempt to kill time I think, lol. I love these quesadillas! I recently put avocado in a quesadilla and ate them for lunch everyday for a week, perfection. Oh my goodness, these look incredible! My mouth is watering just reading this recipe. I’ve given up wheat for lent and have just made some wheat free bread and was looking for the perfect accompaniment – this could be it! YUM, this looks so great! will be trying this out!! Just saw this in the Dinner section of your site and it’s causing me to change my dinner plans to this! 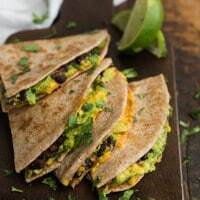 Great recipe, already love black beans, much better (healthier) with whole wheat tortillas, lime juice a plus too, thanks you for this!